Add: 6CEU Webinar in electroacupunture techniques. Normally $125. With purchase of an 8c.Pro only $25. Save $100. The Electrostimulator 8c.Pro is an eight channel percutaneous (beneath the skin) electroacupuncture stimulator. Four output channels will deliver the stronger type, classical milliampere strength electrical current. Four will deliver the optional microcurrent waveform. 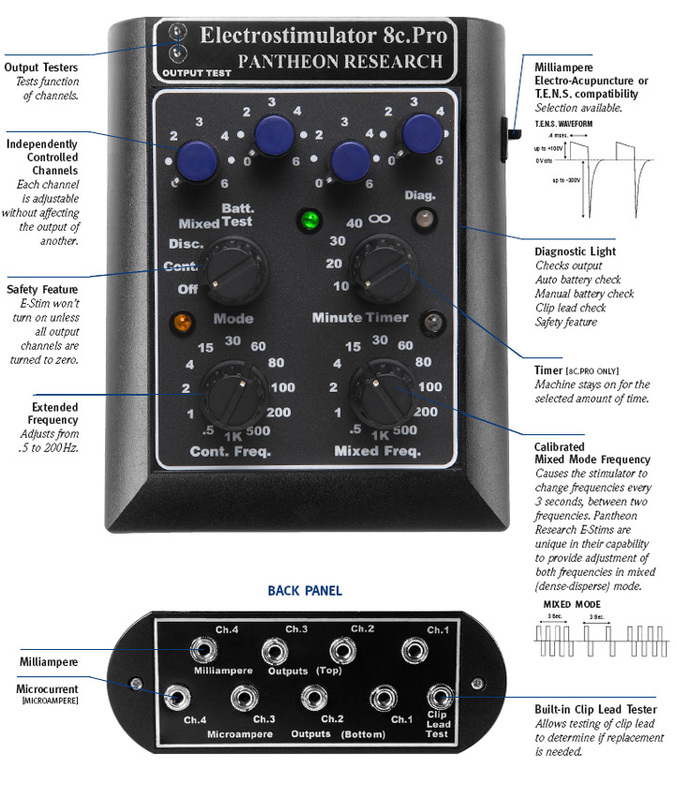 Pantheon Research uses exclusive electrical waveforms that are considered the best type for maximum physiological response of a beneficial nature, the symmetrical biphasic waveform. All of our electroacupuncture stimulators are frequency calibrated to an accuracy level of 99.94%. Includes 2 alligator clips and 2 microclips. These are American-manufactured to high professional and scientific standards. Frequency Accuracy Less than .06% error. No other electro-acupuncture equipment manufacturer can make this claim for the entire range of frequencies within a specific device. Scientific research requires the highest standards of accuracy and integrity. Safety Mechanism All outlets must be turned OFF before the power can be turned ON. This ensures no surprise or pain to your patient should the outlets still be on from a previous treatment. Timer with Tone Allows therapy sessions to be accurately timed. An auto tone will indicate the end of the treatment. You can focus on taking care of another patient without having to keep track of the time. Self Diagnostic Features For the safety of your patients and the effectiveness of your treatments, you can: 1) Test the operation of the clips and lead wires; 2) Check and validate the functioning of a specific outlet; 3) Be alerted when the battery is low and needs replacing. Ergonomic Design Redesigned for better readability and operational comfort. Battery Power Less power is required for E-Stim operation, resulting in longer battery life. The 8pro is already calibrated to a setting, making documentation easier; milli- and micro- amps make for easier ear acupuncture stimulation; and a beautiful simple design that doesn't take up space. Awesome! Thank you, Pantheon, for creating this versatile treatment device. I especially appreciate the flexibility in being able to offer both electro acupuncture and TENS treatment, in milli and micro frequencies. I use it daily for patients with chronic pain and stasis. Patients report the treatments are comfortable and painless. I also appreciate your attentive customer service. All my questions were promptly answered, and the product shipped quickly. Thank You! This is an excellent machine and company. My product shipped quickly, with no complications. John handled all of my customer service questions with knowledge and understanding. The e-stim is working great and my patients are quite happy with the results. They can tell the different between the feel of the current produced from the 8pro compared with the Ito and AWQ machines I had previously. This is a much "softer" feeling current. I like the specificity I can achieve with the settings and that there is a timer. I have use Pantheon machines in the past and am happy to now have my own. All-in-all, I am quite pleased. Thank you, Pantheon Research! Great products and service from Pantheon. I bought my first 8c Pro in 1992. It's still working great. I've added two more over the years to have one in each treatment room. When I had a problem that required a fix the folks at pantheon gladly repaired it. Great products and service. The best full service Estim machine on the market. I recently switched to this machine. It is great to have both Micro and Milli currents on one machine for electroacupuncture. My school uses the 8 Pro exclusively. The staff was very pleasant to work with and I received my order quickly. Started using Pantheons at school (PCOM) and knew I wanted one. They are easy to use and having the timer built in is awesome. Highly recommend them! I have been using 8c, in the micro current mode for the past 13 years, every day and it still works great. It is well made and it works.